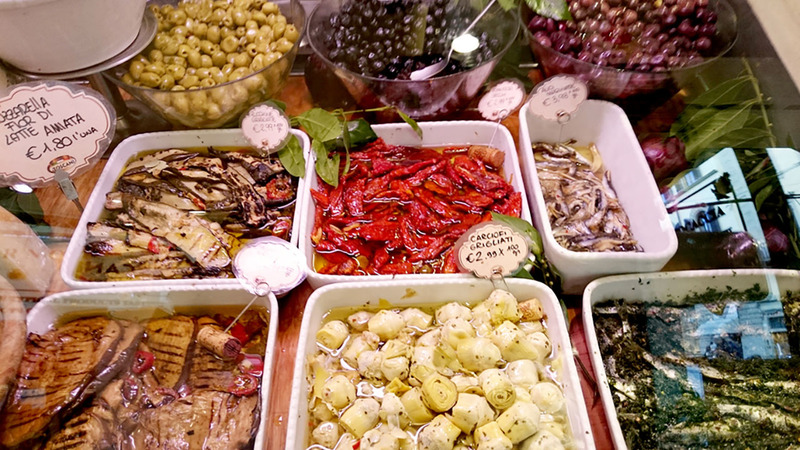 Enjoy an authentic meal in Florence just as the locals do, seeking out local specialties where they are best – be it a local bakery or a renowned restaurant. 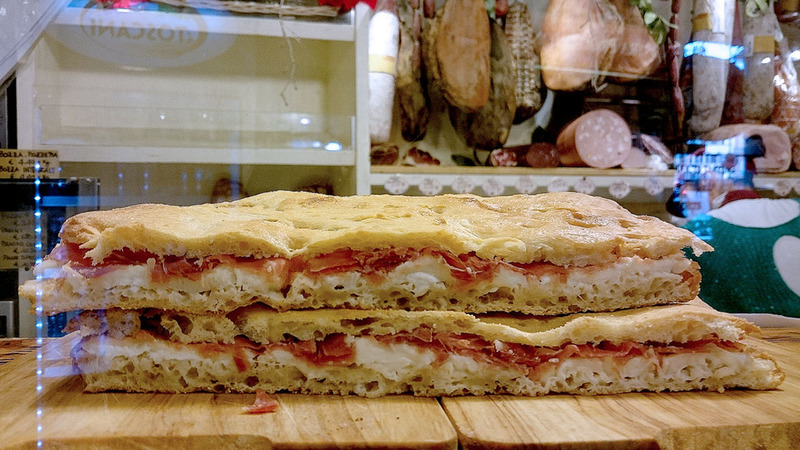 Based in the more local neighborhoods of Oltrarno & Santo Spirito, this Florence food tour lifts the hood on a part of town most visitors never see (led by a local). 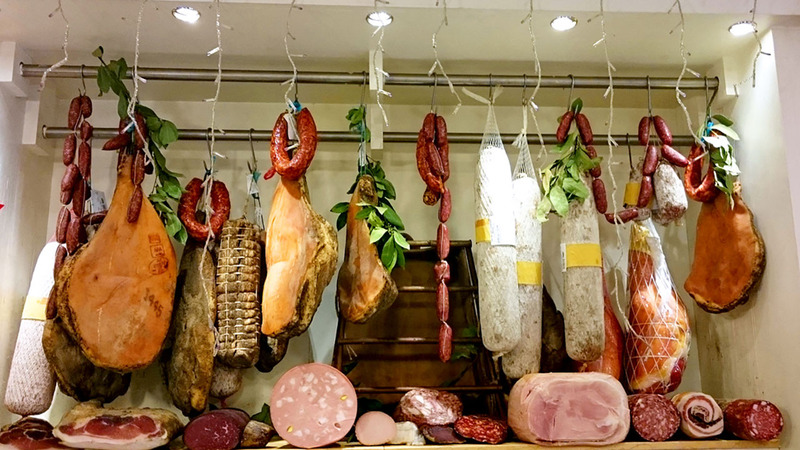 You’ll start with cold cuts, cheese & wine (including a Super Tuscan); move on for bruschetta and more wine; sit down for two traditional starters and a taste of Florence’s famously meaty cuisine; enjoy a digestif; then finish with gelato and a stroll. Our Florence food tour gives you an authentic evening of Tuscan cuisine with a local expert guide. It includes wine, small plates, classic dishes, and of course, gelato, sprinkled with tons of great information and a delightful city stroll. Your Florence food tour starts in the lovely Oltrarno neighborhood of Florence, a step or two off the well-trod tourist path. 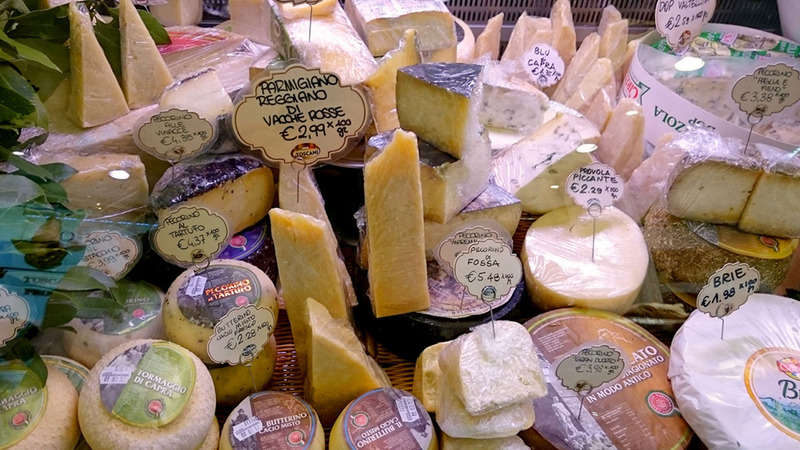 Here you’ll stop in various places (the order changes according to the night) to taste cheese, cold cuts, truffles and Florence’s answer to focaccia, along with various olive oils and balsamic vinegar. Your expert guide will talk you through this, explaining how and why these key ingredients differ so much from one end of Italy to the other. From there it’s a walk through the Piazza Santo Spirito to every Italian’s favorite time of day – aperitivo hour. 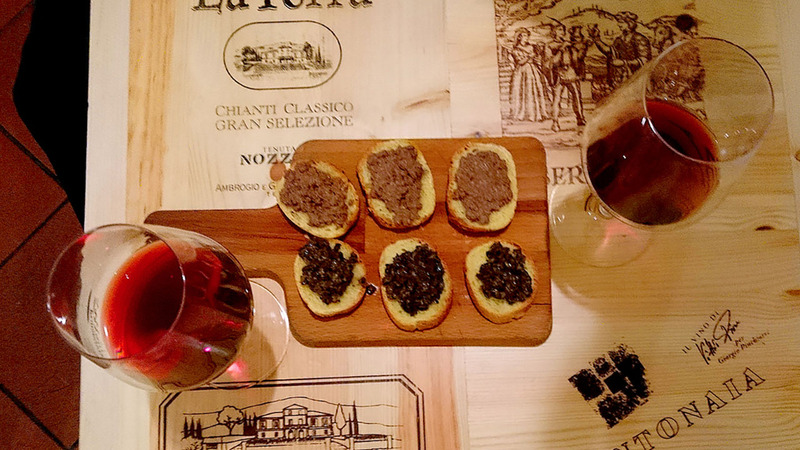 Visit a local enoteca (wine bar) for a tour of the cellars and a wine tasting experience, including either one of the region’s famous Super Tuscans or a very special surprise wine, and local crostini (bruschetta). Passing artisan shops and local bakeries along Via Santo Spirito, you’ll stop in one of our favorite restaurants for an authentic, sit-down dinner. Here you’ll try a classic Tuscan soup, a typical starter, plus a meaty second course that differs according to the season and what's available in the markets. Finally, you end your meal as the Florentines do, with a gelato (invented here in Florence) and stroll back to the other side of the city. Throughout your Florence food tour, you’ll be accompanied by an expert (fun) local tour guide, who will teach you about local ingredients, seasonality and why there’s no such thing as “Italian” food. With a small group of just 14 people or fewer, your experience will be relaxed and casual – more like an evening with friends than a tour. Chiara was great and easy to chat with. She gave us a lot of helpful information and we really enjoyed the food we ate. Would recommend this tour for a nice night on the town around Florence. Our guide was absolutely fantastic. She was the perfect blend of educational and professional, while being very fun and personable. She was a wealth of information, and naturally being very curious and inquisitive, she answered every question I had. My wife and I would certainly recommend this tour to any friend or family member, and look forward to booking our clients on this tour as well. Tour was very good and our guide very nice. There was one stop where we sat outside to taste wine. It was very chilly that evening. If doing this in late March, I would recommend choosing a place that has heated lamps outside. Where we ate last meal was very nice! Our food tour with Eriza was a lot of fun! All of the food was very good. She gave us great information about places we could check out while we were in Firenze. Would definitely recommend! Also note that the order of the sites visited may vary.